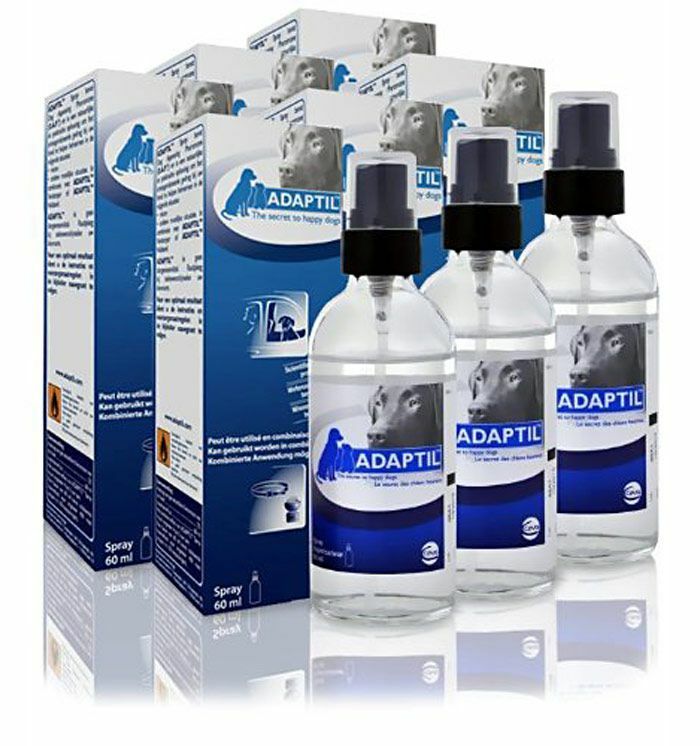 Adaptil (formerly called DAP) spray is a great quick way to help calm your dog in stressful situations and for travel. The price tag is a bit steep for one bottle, but the pump is a micro-mister and used judiciously (3 to 7 pumps per use), will last a long time. You can use the spray on dog beds, crates, and even bandanas as collars when my dogs need some calmness. The Adaptil spray is shorter-lived and overall not as powerful as the Adaptil collar. The synthetic version of "dog appeasing pheromones" used to calm dogs, aid with confidence. Safe and non-toxic, this spray may be used on dog beds, crates, and clothing. Do not spray directly on the dog. The pump produces a fine mist, easy to use and disperse in a large area. What Is Adaptil and What Is It Used for? Adaptil, or Dog Appeasing Pheromone spray, is a natural and non-toxic aid to calm dogs stressed by loud noises such as fireworks and thunder. Adaptil is also useful for a variety of other stressful situations, such as car rides, meeting new people or a new baby, separation anxiety - at home or in a kennel, and busy holiday times. Adaptil spray, like the Adaptil collar, contains a synthetic version of a pheromone secreted by the mother during lactation. This pheromone, aptly named 'dog appeasing pheromone,' gives the puppies a sense of well-being and reassurance while nursing. Adaptil is often used to reduce stress for adult dogs, but Adaptil may also be used during puppy training, to create a sense of calm and confidence as the puppy is socialized, house-trained and obedience trained. This pheromone is odorless and non-toxic, and is not detectable by any species other than dogs, though other mammals have their own species-specific version of this type of pheromone. For many dogs, the calming effect present at birth and early puppyhood remains through life, creating a sense of calm and confidence in stressful or fearful situations. Adaptil spray has a much shorter duration than the collar; 2 to 3 hours versus 30 days. Use the spray for short-acting applications - a few sprays on the dog bed, a crate, a Thundershirt, or even a bandana if you do not have a collar handy. Do not spray this product directly on the dog. Use it alone or in addition to an Adaptil collar or Adaptil diffuser. It is important to note that the spray has an alcohol base, so spritz a few sprays and then let it dissipate for a few minutes before putting the item on or near the dogs.